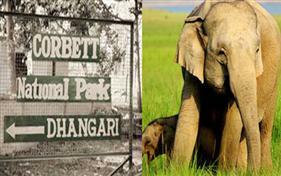 Corbett National Park's main attraction is the wild BIG CAT with varied flora and fauna. This park houses the natural habitat of the rare species of Tigers - Bengal Tigers. It is a place that draws more than 70,000 visitors every year and also offers best views and adventure activities that enthusiast the visitors. Project Tiger Reserve's headquarter is Ramnagar, which is a good place to stay. At Corbett National Park, the authorities have initiated to stop illegal trafficking, naming it as Operation Monsoon. Jim Corbett National Park remains shut during monsoon, and around 400-500 officials from Forest Department are a part of this Operation Monsoon. Due to heavy rains in Uttarakhand (Ramnagar), the road remains shut, so Elephants are being used as a carriage to travel from one place to another.